20.5" x 32" x 19"
(When enlarged to monumental size the seated figure of Alice would be six feet tall). 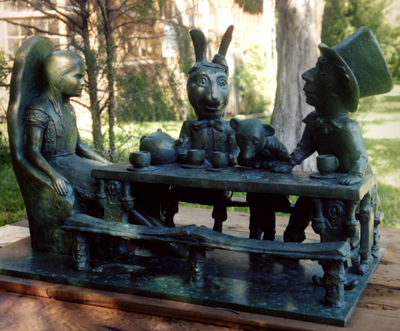 "Tea Party" is shown on exhibit as part of a Sculptureworks, Inc. display at Weston Gardens in Fort Worth, TX. Photograph by Elizabeth Loggins. 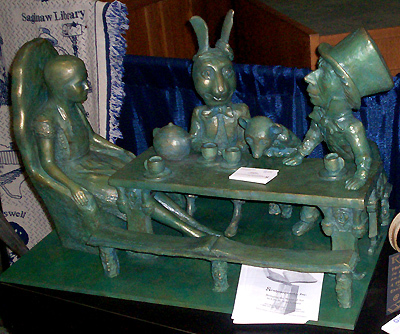 "Tea Party" is shown on exhibit as part of a Sculptureworks, Inc. display in Boston, MA. 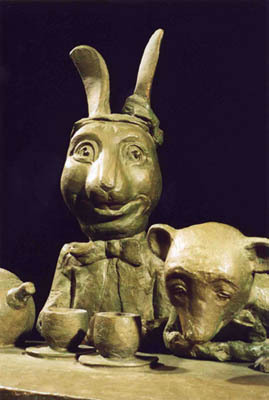 "Tea Party" is shown above in the plaster stage. 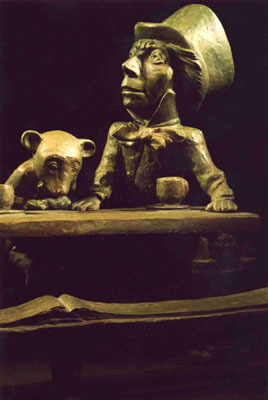 "Tea Party" is shown above in the plaster stage. 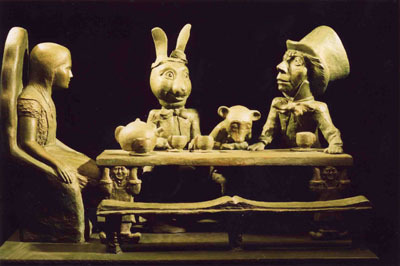 "Tea Party" is shown above in the plaster stage. A delightfully interactive work, the "Tea Party" maquette is greeted with laughter, clapping hands, and grins by adults and children. 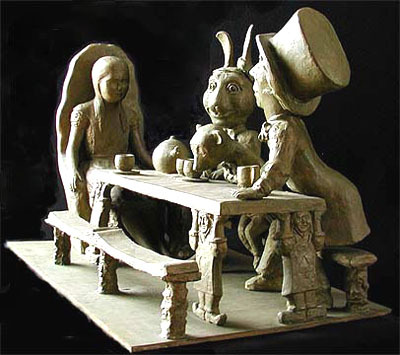 In the sculpture, Alice sits at a table with Rabbit, Door Mouse and the Mad Hatter. The table is set for tea with a teapot and five cups and saucers (one for a visitor). Upon closer look, hidden figures and faces are revealed in the bench, table legs and under the table. There is also an elongated book designed as a bench cushion. Click here to return to George Anthonisen's main page.